Use this full-color Mystic Aura Spirit Board with the planchette or with your favorite pendulum to communicate with your ancestors or other spirts. Spirit boards are very powerful tools used to reach loved ones and spirit guides from beyond the grave. Very similar to a traditional Ouija board, the user submits a question to the spirits, then uses the included planchette and instructions to yield a response in the form of letters A-Z, the words 'Goodbye', 'Yes', 'No', or numbers 0-9 that are printed on the board. The box and board feature the artwork of Anne Stokes, and a sentimental poem is featured on the back of the board. The board could also be used with pendulums. Please note Ouija boards should always be used with care and whatever precautions your faith dictates. Spirit Board measures 12.25 x 15.25 x .25 Inches. The planchette is 3.5 x 5 inches. Item Number: SK-OB412AS | Approximate Size (Inches): 16.00 wide x 0.25 deep x 16.00 high | Approximate Shipping Weight: 2.00 lbs. 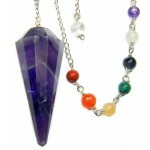 Beautifully crafted Amethyst Chakra Pendulum with chakra beads on a 6”..